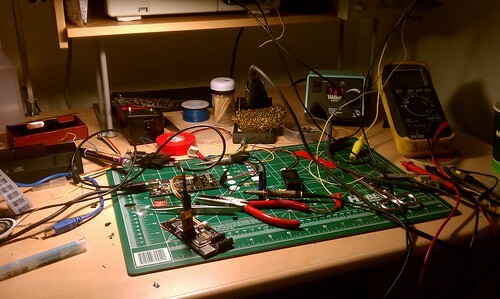 Published on January 23, 2012,	by RyanMSutton in Arduino, Hardware, Hardware. I didn’t change anything with the electronic parts, but did get a new case for the data logger. I tried long and hard but could not find a way to fit the GPS antenna inside the case. The Molex connector goes to the status LED and switch shown earlier. The switch I changed from being a run/stop switch to just switching power, which allows me to get everything packaged up the night before. The usual status LEDs are inside the case, but are not visible during operation, which seems to be ok. The board doesn’t line up with any of the mounting holes, even REV:B which I added mounting holes do not line up, I am pretty sure I can modify the board to fit these mounting holes though. Over all this case it larger then I would like, hopefully with some other modifications I can get the size down a bit. Putting it into this case did stabilize the device quite a bit, I had a good run which I will talk about in another post where it did not reset all day and churned out some very nice data. Published on January 18, 2012,	by RyanMSutton in Uncategorized. While it looks like congress is back peddeling pretty quickly, they are still going forward with SOPA/PIPA which could fundamentally break the internet. Messing with the distributed nature of the internet will but the United States on par with some of the most aggressive censorship countries. In an open letter signed by the 83 high profile internet engineers including Vint Cerf a co-designer of TCP/IP explained their concerns that such legislation would damage the internet. 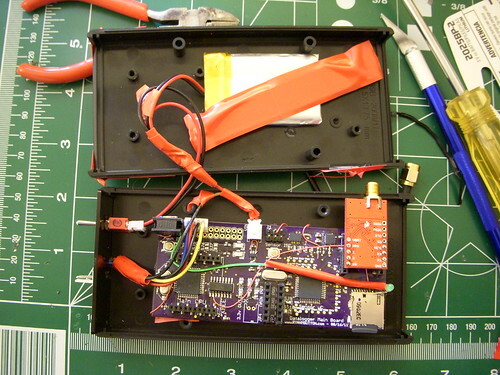 Published on December 13, 2011,	by RyanMSutton in Arduino, Hardware. Finished board, I don't think the date is correct should be 11/19. Least the rev code is right. Now on REV: C finally no flying mod wires on my accelerometer / gyro board. Only the accelerometer is populated as I left off the RC filter for gyroscope, so the board is only half working. 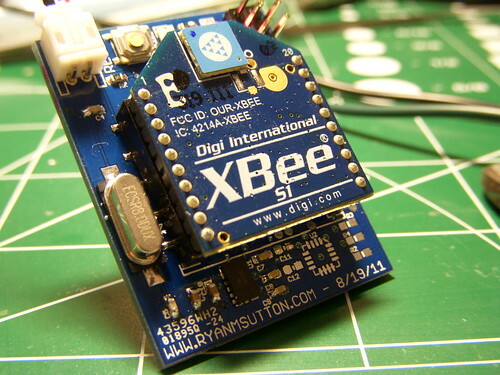 With the micro, xbee, and accelerometer it draws 57.4ma. 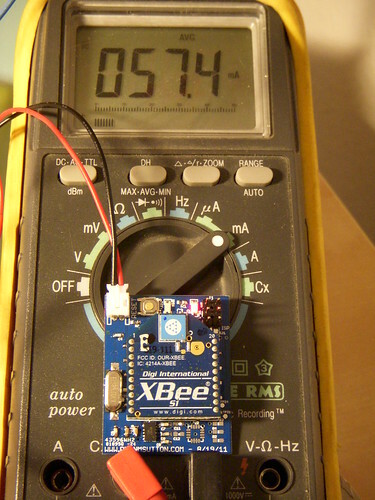 Since the xbee claims to take 50mA, 7.4mA for micro and accelerometer seems pretty good. 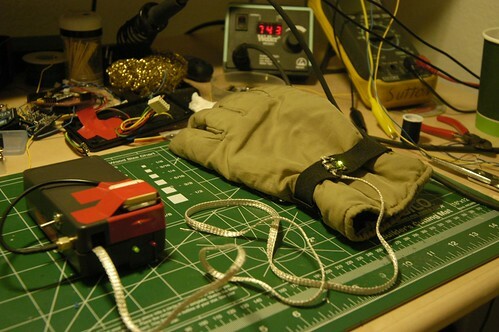 Published on December 13, 2011,	by RyanMSutton in Arduino, Logging Data, Software. The first trip I took the data logger proved that for some reason there is an error that stops it from logging after about an hour and a half. Since I powered it up before leaving home it had stopped before getting to the mountain. 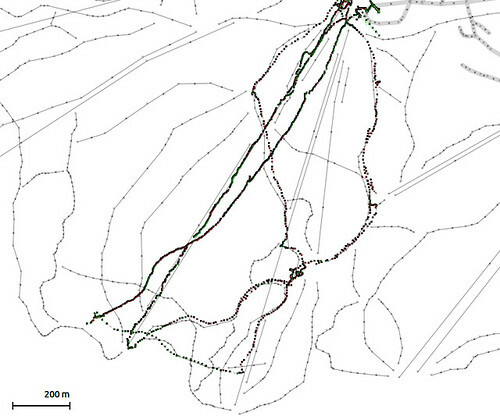 Went out again yesterday and this time powered up the logger in the parking lot and actually got some data! It did stop again after about an hour and a half so I only captured the first three runs. I did reset the main processor at lunch, but it did not start back up so I am guessing it is something on the sensor processor which does narrow down the issue at least. The detail was good, especially after the initial run, I’m guessing it locked some additional satellites once I reached the top of the mountain, as the initial chair lift up track has about 20ft error the west. 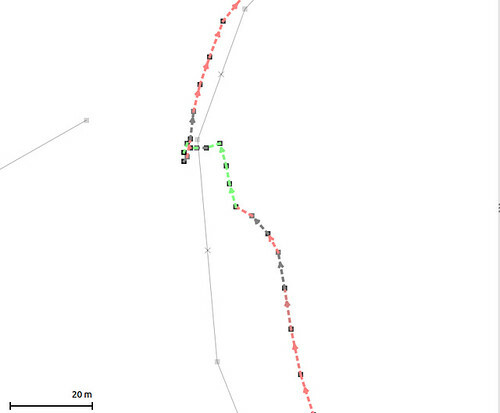 The one of the tracks does show crossing the trail to stop show above. I want to get the timestamps and speed working next, and hopefully figure out why it stops after an hour and a half. 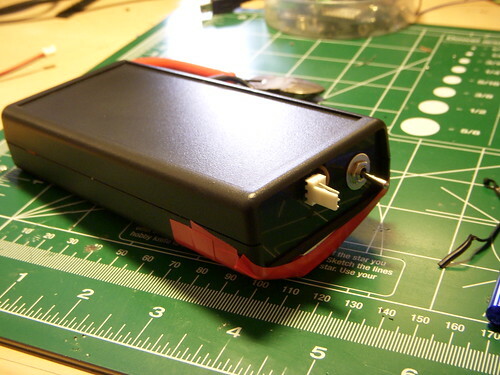 Published on December 4, 2011,	by RyanMSutton in Arduino, Hardware, Hardware. I’m now back to the same functionality I had on the version I built on proto boards though now much smaller. I added a run/stop switch on the side. Each transition from stop to run will result in a new file being started. Two lights on the top, the green one is lit when the uC is in a ‘RUN’ state, the red one flashes after each track point is written to the SD card. 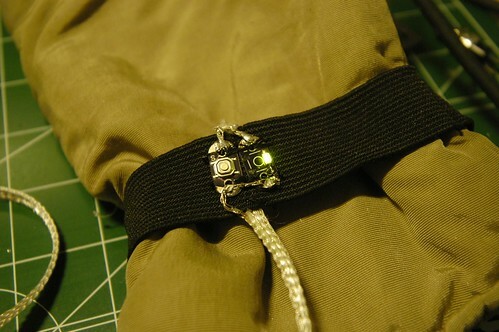 Since the plan is to use this while skiing I used a LilyPad wearable switch and LED sewn into a glove for status and control. The LED is just a duplication of the SD write led on the case. As long as it is blinking, there should be data being written to the card. Each push of the switch will result in a new track segment started ( and the old one closed ). I couldn’t find any of my LED LilyPad stuff so I de-soldered one of the switches and mounted a 1206 LED across the pins. The glove is connected back to the main box with a three conductor ribbon. Hopefully will be trying this setup out tomorrow, interested to see if it actually works. 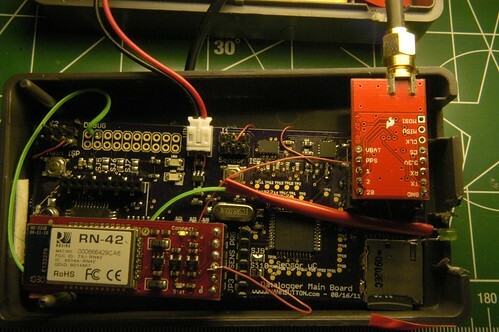 Published on December 3, 2011,	by RyanMSutton in Arduino, Logging Data, Software. Was able to get everything working enough to record some tracks today. The box I used was a bit larger then I would like but it’s the only thing I could find. 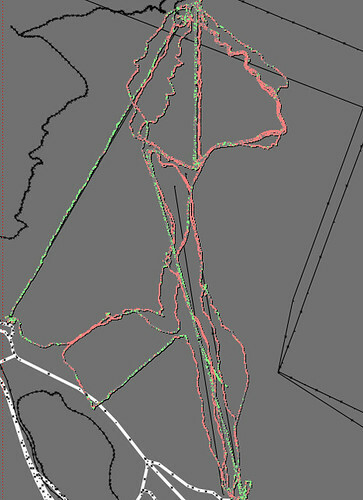 The tracks came out pretty good as far as accuracy, and it does not appear that it dropped any points. Still do not have the timestamps working so I can’t be 100% sure on that last part. It did create three different files indicating that the main uC reset for some reason, though it did recover. 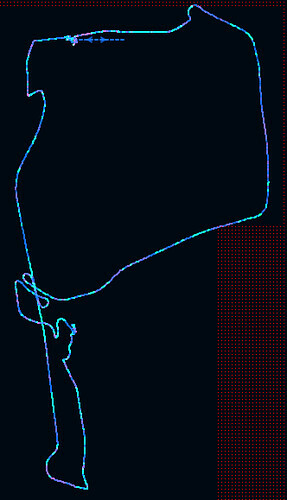 There is some issue with my GPX library, I think strings have some additional overhead in the new version of arduino which is causing problems. I was working on converting things to using pgmprint and char*s anyways so I will keep moving forward with that. I’m going to add some switches, secure the box some more and try again tomorrow. Published on December 2, 2011,	by RyanMSutton in Arduino, Software. Just a quick update to the Sanguino enviroment I’m working with. Fixed an issue in boards.txt where only one of the 1284 boards would show up. Also changed some pin definitions so that hardware SPI works. Full details here.